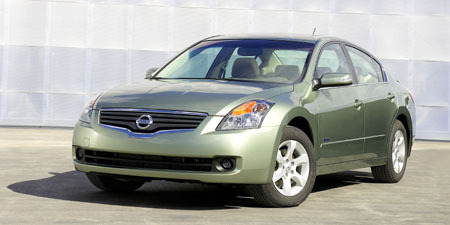 The Altima Hybrid is a 4-door, 5-passenger family sedan, available in one trim only, the HEV. The Altima Hybrid is equipped with a standard 2.5-liter, I4, 158-horsepower, hybrid engine that achieves 35-mpg in the city and 33-mpg on the highway. A variable speed automatic transmission with overdrive is standard. Blue Tooth, Navigational System, heated seats. Very good mileage. Smooth ride. Side curtains and side airbags (not on back seats). Very small trunk. Noticible shifting from electric to gas below 20. No ventilating seats. No automatic seat controls on the front passanger side. I have owned an Altima 96 before starting to look at a new car. I didn't think I would be purchasing another Altima so I looked into Audis, Lexus, and Mercedes. One day on my way to work I decide to stop at a Nissan dealership to see what they got. I wanted to look at a Maxima, however when I saw the Altima it caught my eye! and it was a hybrid. So I test drove it after test driving a Lexus 350, Audi, Saturn and Mercedes. Well I really liked it and the next day I bought. I bought top of the line which has everything I wanted; something that a other models I test drove lacked. The Nissan Altima Hybrid averages 34 for me in the city and highway. It comes with Blue Took, Navigational system with voice recognision. The screen is very clear and not too small. With a subscription you can also get XM radio. XM gives you a 90 day free trial for the radio and traffic monitor. I really enjoy the Nissan Hybrid. I am glad I bought. It has been a very good experience.